Update 1/30/19: The online permitting portal went down following a nationwide system failure from the vendor over the weekend. In light of this inconvenience, the city has extended he grace period for the Short North Permit area through President’s Day weekend. Full enforcement will begin on 2-19-19. Streets located in the Dennison Place neighborhood and portions of Weinland Park, will become metered and permit only starting January 22nd. 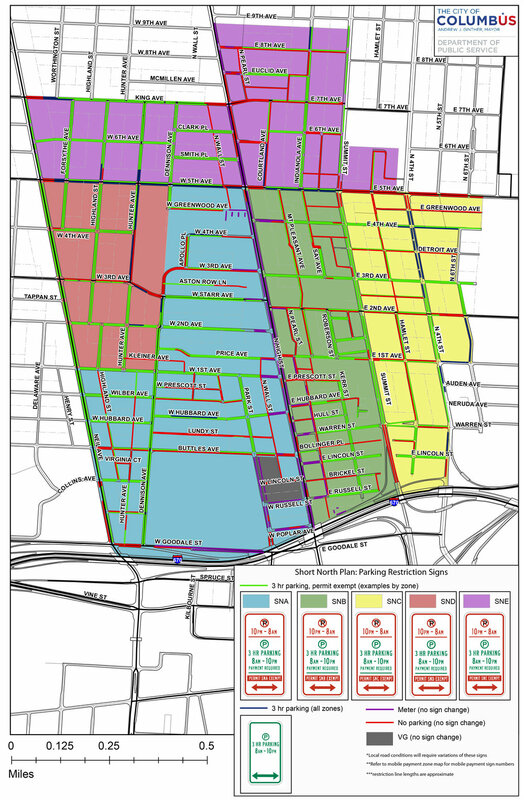 If you are a resident or business located in one of the new permit districts shown below, and utilize on-street parking, you may be eligible for yearly, visitor, and temporary permits according to the new parking rules implemented by the City of Columbus. Detailed information can be found on the Short North Parking Plan website. New metered streets that do not have physical meters in the new permit zones will be pay-by-mobile through the ParkColumbus app available on Apple and Android. For questions on the Short North Parking plan and new permits, contact City of Columbus Parking parkingservices@Columbus.gov or 844-565-1295.